To me, the best organic companies are the ones that make me WANT to eat their food instead of non-organic food! A company that has ALWAYS made me and my family want to eat their food over other similar mainstream foods is Newman's Own Organics! If I set Newman's Own Organics foods in front of you blindfolded I bet you would choose their products over others...and they are made with healthy, organic ingredients and without all the harmful ingredients! Newman’s Own® Organics' products meet all the requirements of the USDA’s National Organic Program. Ingredients have been grown on farms that have not used artificial fertilizers or pesticides for three years or more. The farms and processors have also met the USDA’s organic standards. What I love about Newman's Own Organics is their great variety of products. I received a great selection of their products to try out and I don't think there was a single product that my family didn't gobble up! If I had to choose four favorites from Newman's Own Organics, I would choose the Chocolate Cups, Hint-O-Mint Newman's O's, Fig Neumans, and the Pop's Corn. The Chocolate Cups are A-MAZING! They are my personal favorite products that we received and I just love the melt-in-your-mouth Caramel Cups! I love that they offer dark and milk chocolate but I love the dark chocolate the most! There are five flavors to choose from: Peanut Butter in Dark Chocolate or Milk Chocolate, a delicious Dark Chocolate Peppermint Cup and a rich Caramel cup rounding out the selection in either Dark Chocolate or Milk Chocolate. All five carry Rainforest Alliance Certification. Both Caramel cups carry the USDA Seal. Each box contains three packets and features organic corn and organic palm oil. Consumers concerned about fat consumption will appreciate that no partially hydrogenated oils or trans fatty acids are used. Like all of Newman's Own Organics products, Pop's Corn has been certified organic by Oregon Tilth. We have tried in the past several varieties of Newman's O's but never the Hint O' Mint variety that we received this time! And we are so glad we received it because these cookies quickly became my husband's fave! He loved the cool mint paired with chcolate! These didn't last long in our house! 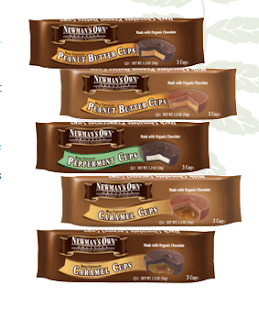 Fig Newmans are the first fig bar made with organic figs, organic sugar, organic flour, and without hydrogenated oils. These are the perfect mix of fruit and sweetness and it is a favorite snack for the whole family in our house! My husband heads to these the minute he comes in the house after work and my son follows begging for a bite! Don't these products sound amazing!!!???? Well, they are and LUCKY for you, you can win these four items below so hurry and enter!!! Buy It: You can purchase all Newman's Own Organics products at many local retailers and stores near you! 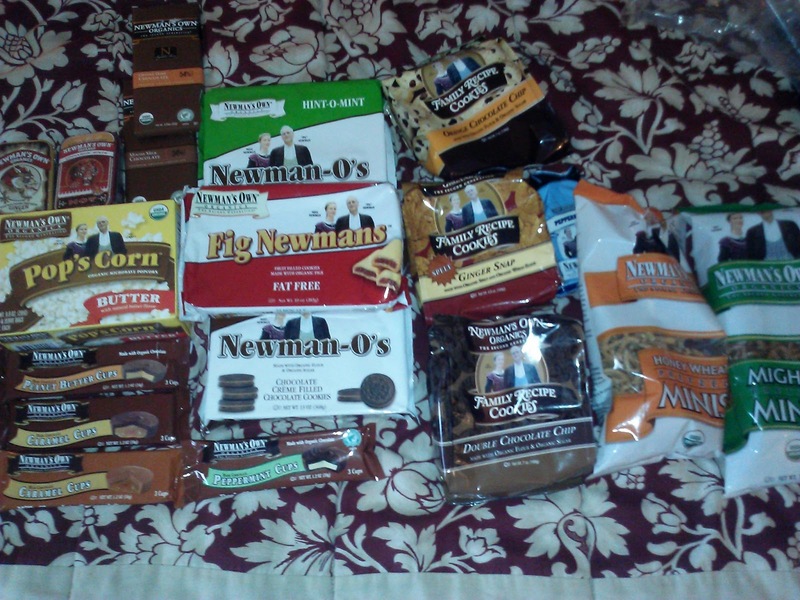 Win It: Newman's Own Organics is generously offering (4) Newman's Own Organics products (plus a bonus surprise item!) including Fig Newmans, Hint-O-Mint Newman's O's, Pop's Corn, and the Chocolate Cups to a lucky winner!